Cruises that visit or depart from Monte Carlo sail in the Mediterranean. Some argue that there is no place more glamorous than Monte Carlo in its beautiful Riviera setting. A favorite destination of the rich and famous, it's a great place for people-watching, and the streets are lined with elegant boutiques and cafes. The best tours visit the casino, the posh Hotel de Paris, the Oceanographic Museum and the cathedral where Princess Grace and Prince Rainier are entombed. 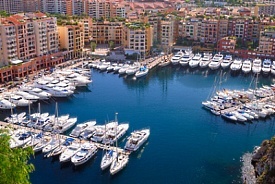 Port Hercules is located approximately 40 minutes from Nice Côte d'Azur Airport. Leave the airport, and at the roundabout, continue straight onto Avenue Auguste Maicon. Get onto the M6202 ramp and continue on M6202 for 2km. Turn left onto Traverse de la Digue des Francais/M6222. Use the right lane to merge onto A8 via ramp to Nice-Nord/Monaco/Genes. Merge onto A8 for 20km, then take exit 56-Monaco toward Monaco/Cap-d'Ail/Beausoleil. Continue onto A500 for 2km then continue onto D6007 for 3km. At the roundabout, take the 1st exit onto Boulevard du Jardin Exotique/D6307 heading to Monaco. Continue for 1.5km, then turn right onto Boulevard de Suisse. At the roundabout, take the 2nd exit to stay on Boulevard de Suisse, turn right onto Passage de la Porte Rouge, right onto Avenue de la Costa, right onto Avenue d'Ostende. Then take a sharp left onto Boulevard Albert 1er, then use the right lane to turn right onto Avenue J.F. Kennedy. Take a sharp right onto Route de la Piscine, then turn left to your destination, Port Hercules.